Over 40 years ago the very first commercial installation of a waterjet cutting system began operation using a KMT intensifier. 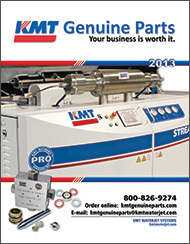 Since then, KMT pumps with KMT Genuine Parts have served customers reliably across many industries, including yours. KMT Genuine Parts are manufactured in the USA to the exact standards as the original parts found on new KMT waterjet cutting machines. Our expertise and operating experience extends from the original SL-I operating at 55,000 psi all the way to today’s industry-leading KMT PRO pumps cutting at 90,000 psi. No other provider has this breadth of experience and you can rest assured that your KMT water-jet equipment will operate at peak performance when you use KMT Genuine Parts.